This Turn ‘N Tumble Home Playset is your Weebles favorite place to play! Fun music plays while your child plays. Comes with 2 Weebles figures, a car, and instructions. Watch your child laugh, play, and learn! Wobblin’ mom and wobblin’ dad, havin’ the most fun they’ve ever had. They tumble and spin in their special way. This home is their favorite place to play! Watch your child laugh, play, and learn with this Turn ‘N Tumble Home Playset for Weebles figures! They don’t fall down, but Weebles do almost everything else in their home: spin, drop, ride in a car, and slide. Fun music plays while your child plays, and fine motor skills and imagination will develop along with the adventures he or she creates for the Weebles characters! The playset comes with 2 Weebles figures, a car, and instructions. Requires 2x ‘AA’ batteries, included. Ages 1 and up. I really was impressed with this toy. It is brightly colored, so that babies will be engaged and stimulated. And the toy is durable, which is a bonus for parents. Nothing worse than baby’s favorite toy breaking, but no worries of that here. I loved that the music is peppy and there are several different tunes it plays, so it is less likely to drive Mom and Dad bonkers. But just in case it still does, there is an on/off switch. And probably the best thing about this toy is that it comes with batteries! There are no small parts, so no choking hazard. All in all, I say this one is a winner. This toy was a huge hit with the 2-year-old set! Nice chunky pieces were perfect for small hands and there were giggles galore. I even had fun getting down on the floor and playing with it! It’s colorful, large and just a great all around toy. I highly recommend this toy for about 1 1/2 to 3 year olds. This is a great starter Weebles set. It lacks the amount of features that are found on the other Weebles sets we have but it is fun nonetheless for most small kids just starting out with the Weebles. The Weebles is a classic product and this set would make a great gift for a new Weebles house or a great starter set for your own. We absolutely love this toy…in fact, we like all the Playskool gear toys. It is not just something to look at, it moves too! There is a handle on the back so the toy can be easily pushed and pulled. When it moves all the gears (and also the eyeball) rotate around. Our daughter loves it when we push it around, she will grab it and move it herself, and she ABSOLUTELY adores when we roll over her with it!! The noise this makes when moved instantly attracts her as well. There are little fabric pieces on top of its head that provide a soft surface on the otherwise plastic toy that she can grab at. The gears are detachable and very easy for a child to lift up themselves (our daughter carries them off with her frequently). 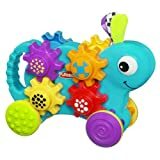 The coolest thing is that the gears on this toy are compatible with the other gear toys from Playskool (Busy Gears and Musical Ball and Gear Center). Bonus! After I bought this, I sort of had buyers remorse. I really wasn’t sure if my 8 month old twins would be into it at all. I was wrong, they love it! They love both the gears and the critter. They love to chew on the gears, bang them on the floor and hold them. The handle/tail on the critter is great for little hands to push and pick up. I can entertain them for a long time, pushing this toy across the floor and having them chase after it. This toy is one of the first toys they go after, so glad I purchased it. My daughter seems to like this toy reasonably well at 11 months. She takes the pieces apart and bangs them on the floor. I think she will come to appreciate the rolling aspect and the gears in time.